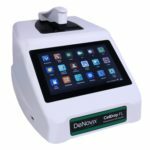 Drawing on technology from the multi award-winning DS-11 Series Spectrophotometer / Fluorometer, CellDrop brings the simple Load, Measure & Wipe Clean functionality of nanovolume spectrophotometers to cell counting. The unique, variable volume counting chamber can be automatically adjusted to the optimum height for each sample, delivering greater accuracy and allowing measurements across the widest range of cell densities, 7x10e2 and 4x10e7 cells without the need for dilution or concentration. Combining dual fluorescence and brightfield optics with powerful on board EasyApps® software enables a range of cell counting, viability and transfection efficiency assays. Instruments come pre-installed with apps for AO/PI, Brightfield, Trypan Blue, GFP and allows the functionality to easily customize methods. The CellDrop is a stand-alone instrument, with a high definition, 7” touchscreen ideal for reviewing live images, data and reports. All instruments contain Wi-Fi, USB, and Ethernet connectivity, allowing users to easily export data via email, network drives, network printers or USB drive. CellDrop is available in dual fluorescence and brightfield or brightfield only models. DeNovix Inc., founded in 2012, is a multi-award winning instrumentation company based in Wilmington, DE, USA that develops, manufactures and sells laboratory equipment to meet the demands of today’s evolving life science research. The company’s products include stand-alone UV-Vis spectrophotometers, fluorometers and integrated spectrophotometer / fluorometer instruments, cell counters and assays. Additional information is available at www.denovix.com.